Use the form below to contact accommodation Villa Adasa directly. 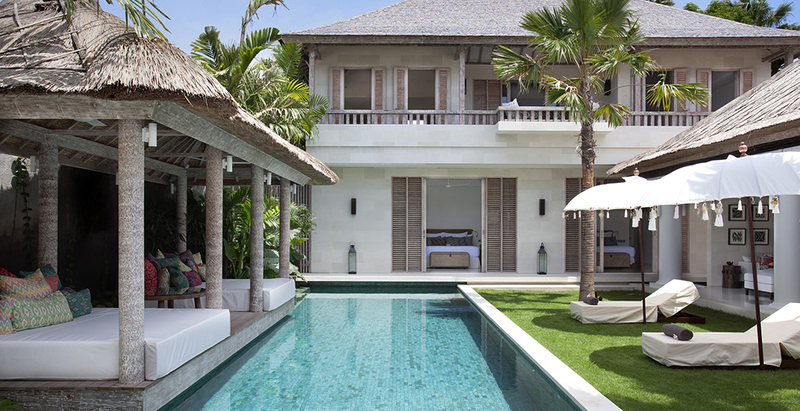 Those yearning for lashings of style and a stand-out Seminyak location a heartbeat from La Lucciola, Kue De Ta and the Breeze at Samaya need look no further than Villa Adasa. 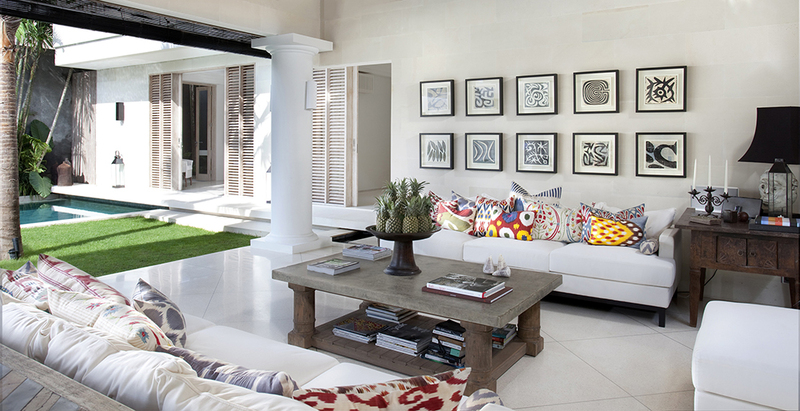 This beautifully designed three-bedroom villa is coccooned within the exclusive Laksmana Estate moments from Bali’s most famous restaurants, bars and boutiques. Yet such is its charm, you might find it difficult to step beyond its grand bronze-handled doors. An oasis of repose, Adasa reveals the influence of traditional Balinese architecture in the magnificent open-sided vaulted living pavilion and the liberal use of local materials (alang-alang roof, Palimanan stone walls, floors of terrazzo and polished teakwood). The interiors are achingly chic – black and white prints of 1930 Bali balance batik cushions in wild contrasting colours, an antique mirror reflects the bowls of orchids adorning the large dining table, Turkish and Tibetan rugs ripple across acres of floor. In contrast to such traditional touches yet completely in keeping with the clean contemporary lines are welcome 21st Century luxuries like Satelite TVs, Sonos music system and Bose sound system. There’s luxury in the sense of space too – entertaining is a breeze, yet myriad terraces, balconies and private spaces provide quieter areas of retreat. This is a glamorous ‘grown-up’ villa and perfect for a group of friends who want to be in the thick of the action, yet families with kids, especially teenagers who appreciate the freedom to wander down to the beach in minutes, will not feel short-changed. 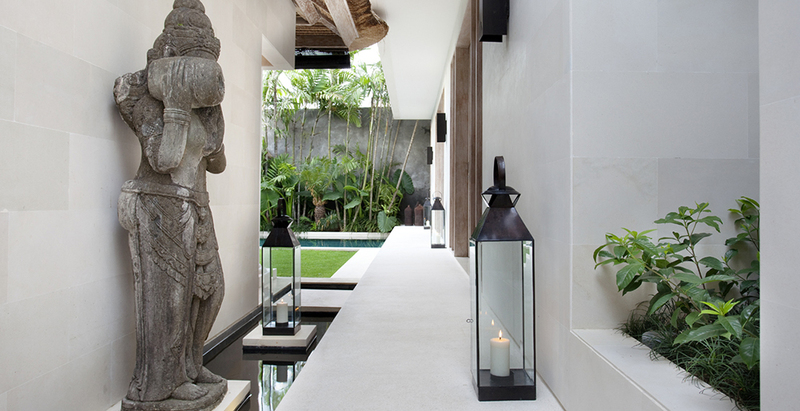 Villa Adasa is located in the Laksmana enclave, an exclusive gated community with round-the-clock security in the heart of Seminyak’s ‘Golden Triangle’ – the chicest area on Bali’s south-western coast. Only 200m from the beach, the villa is a short stroll from some of the best restaurants and bars on the island, including La Lucciola, Petitenget, Metis, Sarong, Ku De Ta and Potato Head. (The Miele Guide rates Ku De Ta and Sarong in the top 20 restaurants in Asia). 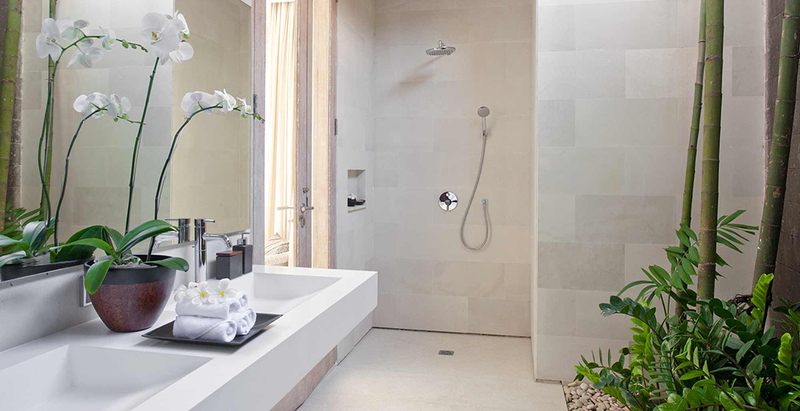 Also within walking distance are boutiques, lifestyle shops and spas – the famed Jari Menari will even send a therapist to the villa so guests enjoy spa treatments in privacy. Close by is Pura Petitenget, one of Bali’s most sacred temples and the site of some spectacular ceremonies. 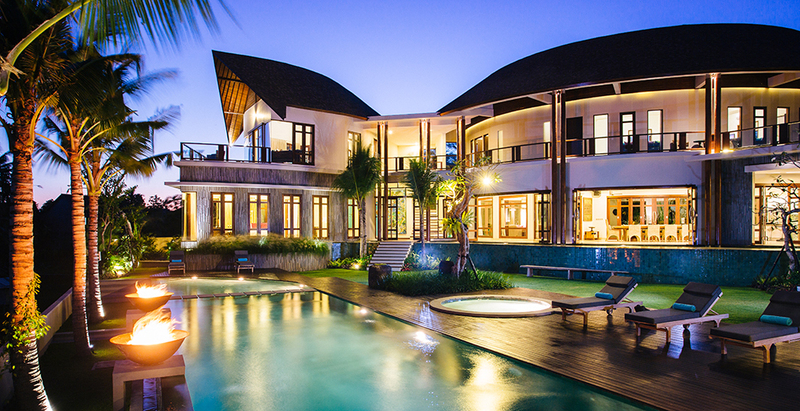 LOCATION : Seminyak, south-west Bali, Indonesia. CAPACITY : 6 people (3 ensuite bedrooms: 1 with king-size bed, 2 with twins convertible to king); 2 extra beds on request (extra costs apply). LIVING AREAS : Huge open-sided living and dining pavilion with seating for 8; upstairs air-conditioned TV room/office within master bedroom suite; poolside bale; sun terrace. STAFF : Manager; chef; butler/service staff (24-hour); gardener; security. Additional staff (babysitters, masseuses) available on request. DINING : Breakfast is complimentary. For other meals – Western, Asian, vegetarian and children’s dishes from a priced menu. Requests accommodated (including special diets). COMMUNICATION : Wi-Fi internet; telephone landline (local and IDD calls extra). ENTERTAINMENT : Satellite TVs; DVD players; DVD library; Sono sand Bose music systems; iPod docks; books and magazines. FOR FAMILIES : Villa Adasa is well equipped for families. Facilities include a high chair; baby cot; pool safety fence (on request). SPA : On request, treatments selected from a comprehensive spa menu can be carried out by professional beauty therapists in the privacy of the villa (extra costs apply). TRANSPORT : Villa Adasa’s central location means that many attractions are within easy walking distance. If additional transport is required, the villa manager will happily call one of the island’s safe and reasonably priced metered taxis, or organise the hire of a car and driver. ADDITIONAL FACILITIES : Barbecue; in-room safes; massage bed; generator back-up. EVENTS : Events for up to 25 people can be arranged with prior notice. PROPERTY AREA : 500 square metres. 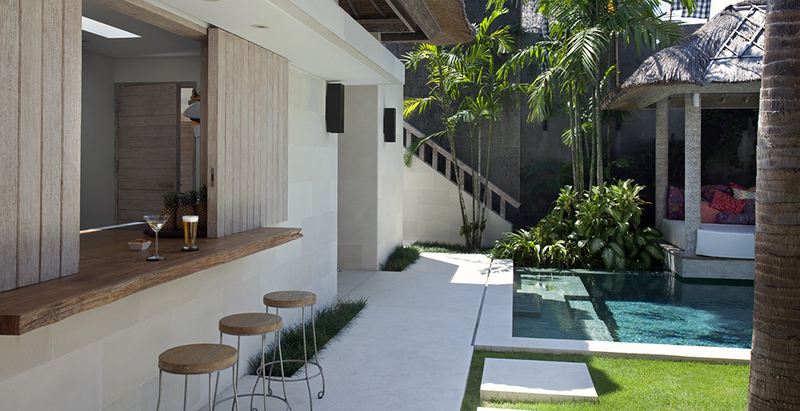 LOCATION : Seminyak, south-west Bali, Indonesia. CAPACITY : 6 people (3 ensuite bedrooms: 1 with king-size bed, 2 with twins convertible to king); 2 extra beds on request (extra costs apply). LIVING AREAS : Huge open-sided living and dining pavilion with seating for 8; upstairs air-conditioned TV room/office within master bedroom suite; poolside bale; sun terrace. POOL : 7 x 4 metres. STAFF : Manager; chef; butler/service staff (24-hour); gardener; security. Additional staff (babysitters, masseuses) available on request. DINING : Breakfast is complimentary. For other meals - Western, Asian, vegetarian and children’s dishes from a priced menu. Requests accommodated (including special diets). COMMUNICATION : Wi-Fi internet; telephone landline (local and IDD calls extra). ENTERTAINMENT : Satellite TVs; DVD players; DVD library; Sono sand Bose music systems; iPod docks; books and magazines. FOR FAMILIES : Villa Adasa is well equipped for families. Facilities include a high chair; baby cot; pool safety fence (on request). SPA : On request, treatments selected from a comprehensive spa menu can be carried out by professional beauty therapists in the privacy of the villa (extra costs apply). TRANSPORT : Villa Adasa’s central location means that many attractions are within easy walking distance. If additional transport is required, the villa manager will happily call one of the island’s safe and reasonably priced metered taxis, or organise the hire of a car and driver. ADDITIONAL FACILITIES : Barbecue; in-room safes; massage bed; generator back-up. EVENTS : Events for up to 25 people can be arranged with prior notice. PROPERTY AREA : 500 square metres. 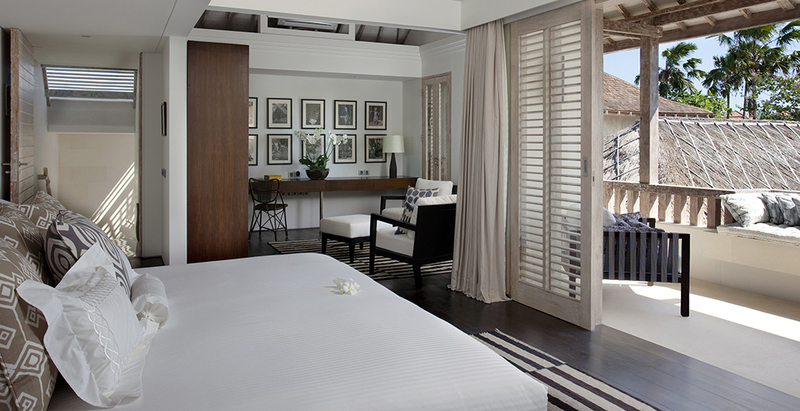 Located at the northern end of Legian, Seminyak is Bali’s most stylish and cosmopolitan beach resort. It combines a little urban chic with a vibrant European style atmosphere and attracts affluent package tourists and a constant flow of trendy clubbers. 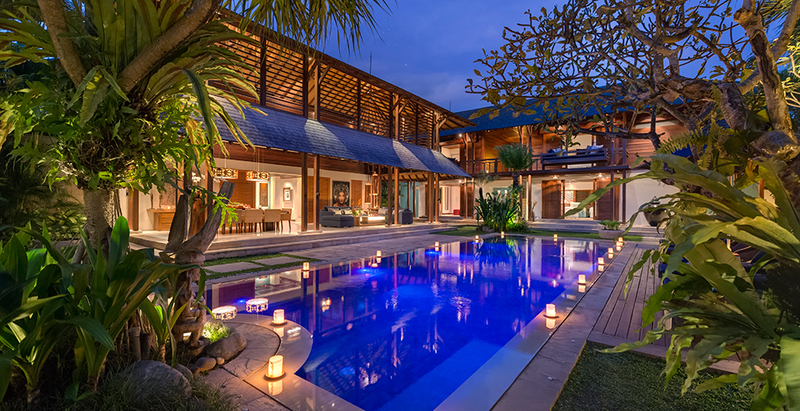 Seminyak is Bali’s most fashionable area, home to among the island’s luxurious resorts and host to a number of fine restaurants and boutiques. Fashion stores and top dining spots with international chefs cooking up world-class cuisine line the streets, from Jalan Petitenget to Jalan Kayu Aya. Seminyak’s Petitenget Beach offers a more secluded ambiance compared to its sister strands of Kuta and Legian to the south. However, after sunset a livelier nightlife scene takes over. Chic hotels such as the W Retreat & Spa, or premier dining and entertainment venues such as Ku De Ta and the Potato Head Beach Club, have all garnered an international following. Seminyak Beach offers a more refined resort feel compared to its neighbouring areas of Kuta and Legian, home to among the island’s best dining, nightlife and entertainment venues. 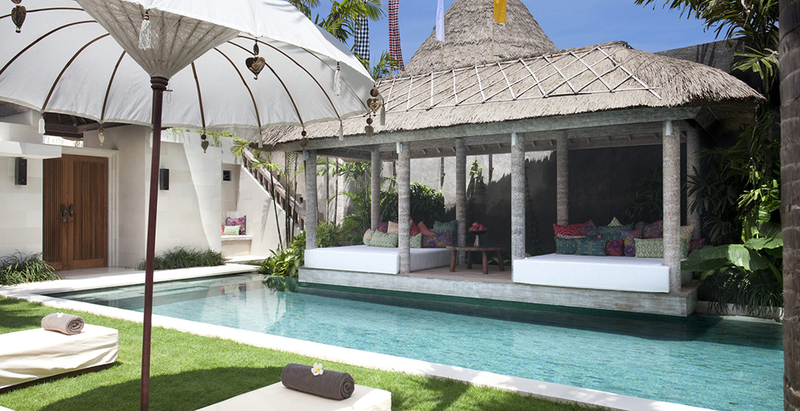 Seminyak outshines the two as the island’s most prized beach resort area. Undercurrents are usually strong, and surfing is mostly for the advanced. Other activities to be had along the coast include horseback riding that starts from the Umalas stables in Canggu in the north, down to Seminyak’s Petitenget coast and Legian’s Blue Ocean Beach area. 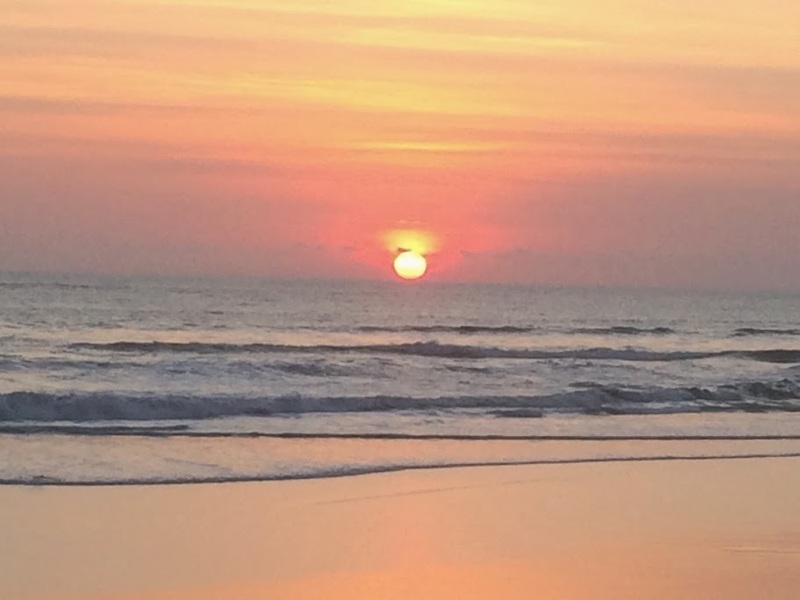 Seminyak sunsets are not to be missed, best enjoyed while chilling out with friends around the glitzy poolsides of the WooBar at the W Resort Bali, or down on the beachfront lawns of Ku De Ta or the Potato Head Beach Club. Seminyak Beach offers a more refined resort feel compared to its neighbouring areas of Kuta and Legian, home to among the island’s best dining, nightlife and entertainment venues. 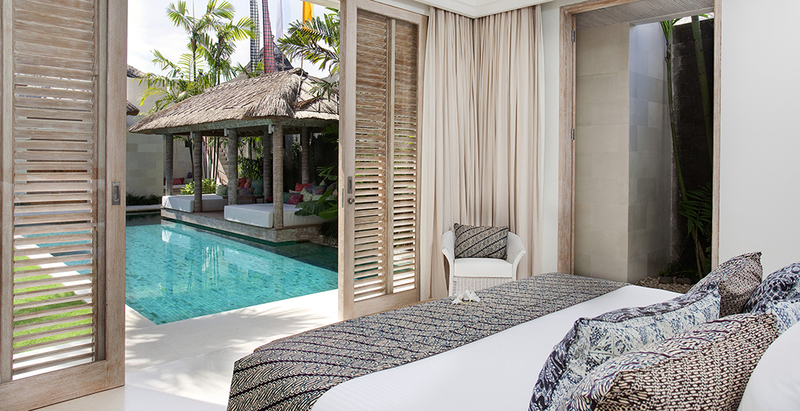 Seminyak outshines the two as the island’s most prized beach resort area. Undercurrents are usually strong, and surfing is mostly for the advanced. Echo Beach is one of Bali’s most recently christened surf spots. The nickname overshadows its local name ‘Pantai Batu Mejan’, after a significant Balinese Hindu sea temple on site. Petitenget Beach is a continuous expanse of grey sand stretching in both directions as far as the eye can see. To the south it becomes Legian Beach and then Kuta Beach, but is noticeably quieter than both. The sunsets here are famous, and opportunites abound to mix with the glitterati who frequent the high end beach front estalilshments such as Ku De Ta. Easy access points to the beach are at the end of Jalan Dhyana Pura, and from the large public car park (Rp 2,000) between Petitenget Temple and La Luciola restaurant. The streets of Seminyak are increasingly jammed, with Jalan Laksmana being a particular black-spot. Your best options here are to walk or rent a motorcycle/bicycle. Taxis are everywhere available for a small price. Be sure the taxi driver put on the taximeter. Current underflows can be strong, always swim between the red and yellow flags, don’t swim too far out! Do not leave your belongings unattended on the beach. Do not do drugs! It can carry the death penalty, and there are enough foreigners residing in Bali courtesy of the Govt. prison service! Do not touch people’s heads – it is very offensive to Hindus. Do not forget to look and listen while you cross the road. Cars may stop, motorbikes may not! At cremations, do not get in the way of the attendees – however important that photographic opportunity is! In a temple: Always wear a sarong and sash. Driving: In Bali always expects the unexpected; always keep your eyes open and your mind on driving. Please be very careful when changing your money. Always check the rate of exchange and commission (if any) the money changer is taking. Most importantly, always count your money before you leave the premises and if you can, bring your own calculator, as the ones used by some places can be “a little inaccurate”. Seminyak Beach and Petitenget Beach is a continuous expanse of grey sand stretching in both directions as far as the eye can see. To the south it becomes Legian Beach and then Kuta Beach, but is noticeably quieter than both. The sunsets here are famous, and opportunites abound to mix with the glitterati who frequent the high end beach front estalilshments. Pura Petitenget at the beachside off Jl Petitenget is a compact, pretty Balinese temple, which is known for particularly spectacular beach-side ceremonies. A must-see, especially if you’re staying in the area, the centuries-old temple comes to life during its festive 210-day anniversaries. The name of the street that runs parallel to the beach is actually taken from the temple. Also, the namesake Petitenget Beach is only a few steps away from the temple where visitors and locals enjoy the best spots to share in the gorgeous sunset moments. Kendra Gallery serves as a unique art space where you can freely drop in to browse through the vibrant works on display, and where like-minded visitors mingle with the creators behind the artworks at any of its featured exhibition openings. A great place to escape the hectic traffic of downtown Seminyak, Kendra Gallery is within a 10-minute walk to Jalan Laksmana. Location: Jalan Drupadi 88B, Seminyak. 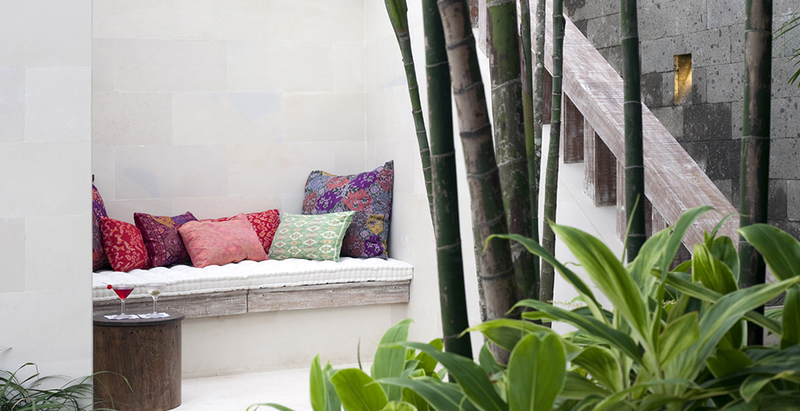 Seminyak is the high-end spa capital of Bali. Your spa experience here will be one of great luxury in a sophisticated setting. You pay up for all of that of course, but the prices are still 50% or more cheaper than you would pay in a western country. Fashion stores and top dining spots with international chefs cooking up world-class cuisine line the streets, from Jalan Petitenget to Jalan Kayu Aya. 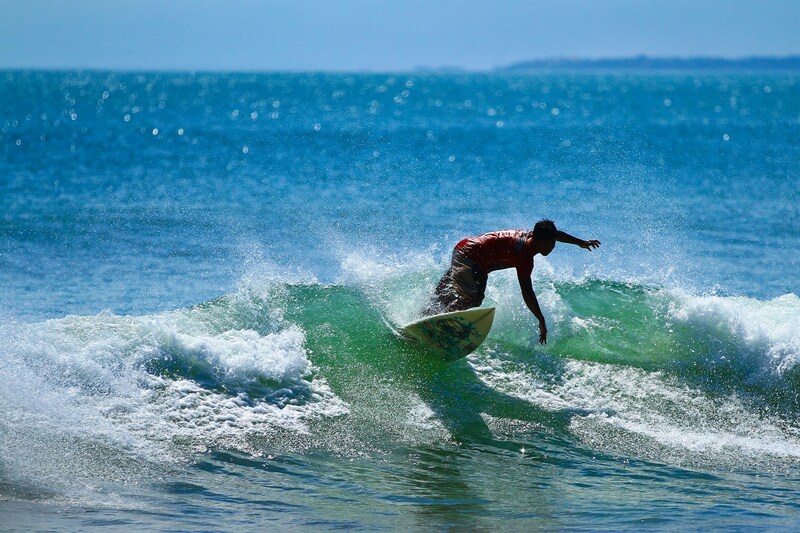 Sufting: Conquer the waves around Seminyak - No matter if you are new to surfing or you are an experienced surfer, the beaches around Seminyak offer great opportunities. 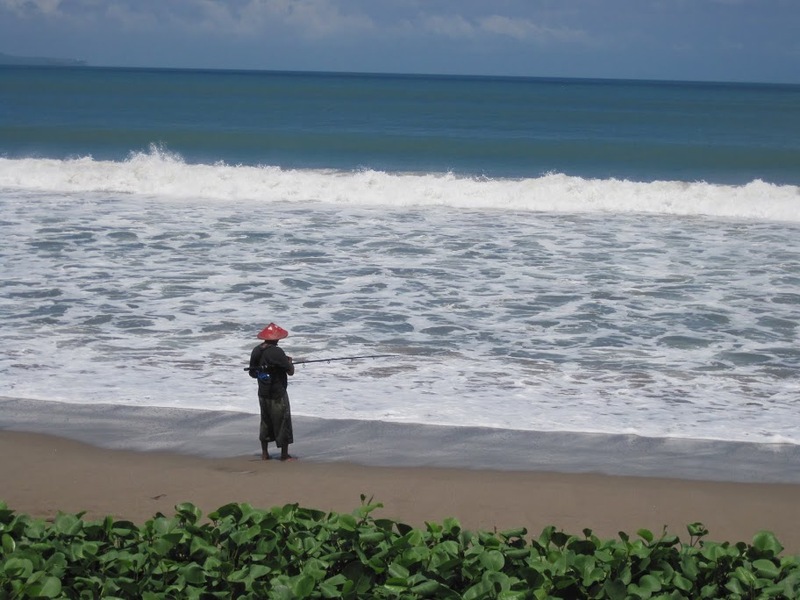 Beginners will find suitable waves at Kuta and Legian beach, while expert surfers can take on the more challenging breaks at the beaches north of Seminyak. Boards can be rented almost everywhere, and several surf schools around Seminyak will teach you to master waves. Visit one of Seminyak´s stylish beach clubs - Along the beach, several elegant beach clubs attracts the glitterati of Seminyak. You shouldn’t deny yourself a visit to at least one of them whether it will be for a lazy breakfast, to lounge by the pool during the day, to watch the sun sets into the Indian Ocean, an evening cocktail, or to dine in one of the beach Club restaurants, which are among some of Seminyak’s best. Rooftop dining Seminyak is having a love affair with rooftops. And why not, when the weather is this good? SOS Supper Club, on the roof of Anantara Seminyak hotel, is the leader of the pack, with nightly DJs and unfettered views of the Indian Ocean. Book a table under the stars for a steak dinner or flop on a day bed to snack and watch the stars come out with a Bali Classic in hand (strawberry, lime, cranberry, lychee with pomegranate juice and sparkling wine) or a pitcher of SOS punch. Shopping - The island's best fashion is found in Seminyak, with beautiful, often handmade clothes at a price you'll never find in Europe, USA , Japan or Australia. Join the party crowds at Seminyak’s clubs - Seminyak might still be the home of Bali’s craziest nightlife, but if you want to party in style Seminyak is the only place to be. Friday and Saturday night are the liveliest any time of the year, but in the peak seasons you can dance on the beach or sip cocktails until late any night of the week. The best restaurants in Seminyak make up most of Bali’s greatest and most well-established dining spots, with the streets throughout this upscale beach resort area being recognized as must-visit dining destinations. Ku De Ta is easily one of Seminyak’s famous long-running nightlife institutions – often considered the trendsetter for upscale nightlife and beach dining in Seminyak, and an inspiration to other similar beach club venues all over the island. The venue features a unique layout with a main restaurant area, a dedicated bar, a centrepiece lawn bordering the beachfront where all special events take place and a special private loft for secluded VIP-style moments. Mozaic Beach Club extends the quality-dining scene of Ubud’s Mozaic Restaurant Gastronomique to the southern shores of Bali, with a twist. A poolside bar and lounge with a seaside sundeck offers a laidback alternative to the sophisticated private dining restaurant north of the blue tiled pool. As the only beach club on this black-sand beach, Mozaic Beach Club offers two different dining scenes. SOS Supper Club is one of Seminyak’s trendiest chill-outs, offering a relaxing vibe, stylish settings and a high vantage point overlooking the rolling surf and dramatic sunsets. 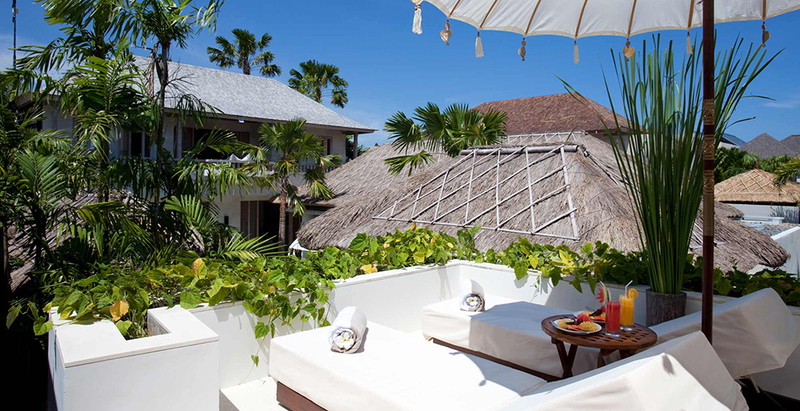 Comprising an open-air restaurant and cocktail bar, and a lively space for gigs and clubbing, the venue forms the signature lounge of the Anantara Seminyak Bali, located at the beachfront end of Jalan Abimanyu (formerly known as Jalan Dhyana Pura). Potato Head Beach Club has fast gained popularity as one of the most happening venues in Seminyak, joining the array of world-class hotspots that line this upscale, cosmopolitan coastal village. The venue is next door to the W Retreat, and its access from the main Jalan Petitenget road is similar to W’s, with a long and narrow lane that transports you to a world of drinks, dining and partying on its lawn beachfront. Cocoon is a striking venue on the corner of Jalan Double Six, the legendary beach street famous for its hangouts and nightlife in southern Seminyak. It features an inviting blue centrepiece pool surrounded by white sun loungers, serving as a cool pool retreat with sea views and embroidered traditional Balinese parasols by day. Cocoon serves Asian fusion and Mediterranean cuisine and offers a great chill out scene with innovative cocktails to match the sunsets. (Jlan Double Six). Hu’u Bar is among the most celebrated venues on Jalan Petitenget in Seminyak. The venue is part of the Hu’u brand that also features a restaurant and luxury accommodation facilities. Hu’u first opened in 2001 and has since enjoyed success with crowds of partygoers and diners from around the world. Mint Bali - If Seminyak’s well-established venues don’t get you grooving enough, you might want to check out this latest addition on Jalan Petitenget that specifically caters to lingering clubbers who still have the oomph to dance into the wee hours. Mint Bali is a go-to place for late evening drinks and after-dinner gatherings with friends. Pull up at smokin' Mamasan, the cooler little sister to Seminyak dining stalwart Sarong, and order the snapper dumplings for a taste epiphany (Jl Raya Kerobokan 135. Mades Warung - Don't be expecting the usual dingy tiles and rickety tables at the island's most famous warung (restaurant). Made's is all-singing, all-dancing, with a cute little Balinese dance show each night. At Jl. Seminyak. Other good Restaurants are: Ultimo, Chanti, The Breeze (alli in Jl. Kayu Aya). and Metis in Jl. Petitenget.